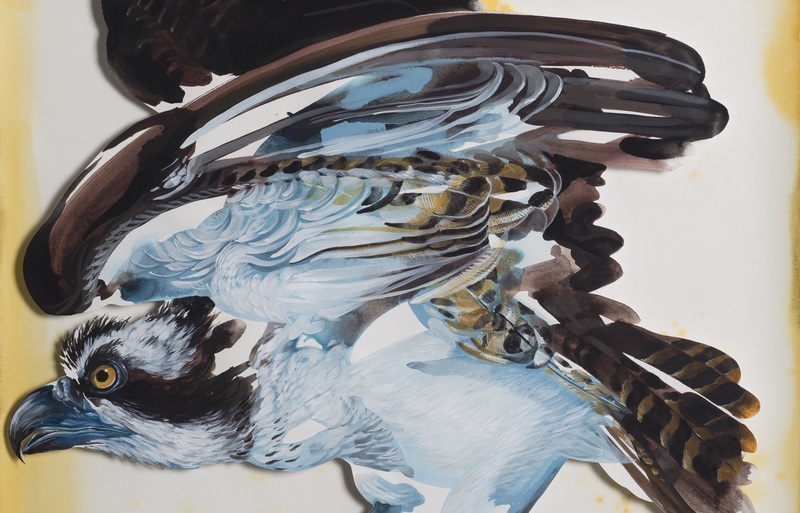 The Halsey Institute of Contemporary Art is pleased to present the exhibition The Image Hunter: On the Trail of John James Audubon, featuring new work by the Italian artist Hitnes. The exhibition is a culmination of The Image Hunter project, in which Hitnes retraced Audubon’s travels in the United States and created work during a residency in Charleston, SC. John James Audubon spent the early decades of the nineteenth century tracking birds and drawing them with the goal of creating a compendium of all of the birds in the United States. Charleston played an important role in Audubon’s work as he kept a studio here in the home of his friend and fellow naturalist John Bachman. Audubon searched for specimens on the Sea Islands off of Charleston’s coast, and he even included the city’s distinctive skyline from the 1830s—replete with church steeples—in his drawing of the long-billed curlew. Nearly two hundred years later, the Italian painter and muralist Hitnes embarked on a twenty-city road trip to retrace and rediscover the America that Audubon traversed in the making of his opus The Birds of America (1827–38). Traveling along Audubon’s exploratory routes, Hitnes sketched and painted what he saw, creating an updated visual documentation of the birds Audubon painted. This body of work, along with objects and ephemera collected along the journey, will be on view at the Halsey Institute beginning in August 2018. The exhibition follows Hitnes’s residencies in Charleston at the Halsey Institute in the Summers of 2017 and 2018. Born in Rome, where he currently lives and works, Hitnes is a painter and muralist. A frequent traveler, Hitnes has completed residencies in countries including China, Australia, Mexico, Russia, Norway, Colombia, and the United States. His work has been featured in venues around the globe, including the Instituto Italiano di Cultura, New York; Museo Civico di Zoologia, Rome; 999contemporary, Rome; and Fifty24MX, Mexico City, among others. During his 2015 trek throughout the United States, Hitnes painted several public murals. For each mural, he painted a specific bird that he discovered nearby. Larger than life, the murals serve as a public reminder of the avian creatures that Audubon pursued. Here is a list of all the locations of the murals as part of The Image Hunter project.